Mise en place. Pick your poison — semi sweet chocolate (chips work fine as does a bar) or cocoa (Penzey’s natural is my fav). You’ll also need heavy whipping cream, vanilla, and sugar if you’re using cocoa. If you’re gluten-free, please be sure to read your labels for your vanilla and chocolate to be sure they’re gluten-free. These are both super quick recipes and very easy. The one with the cocoa powder is what I use when I make triple chocolate torte (recipe coming eventually! :)), but frankly they both taste very similar. 1. Bring 1/2 c. (118 ml) heavy whipping cream to a boil in a small saucepan. 3. 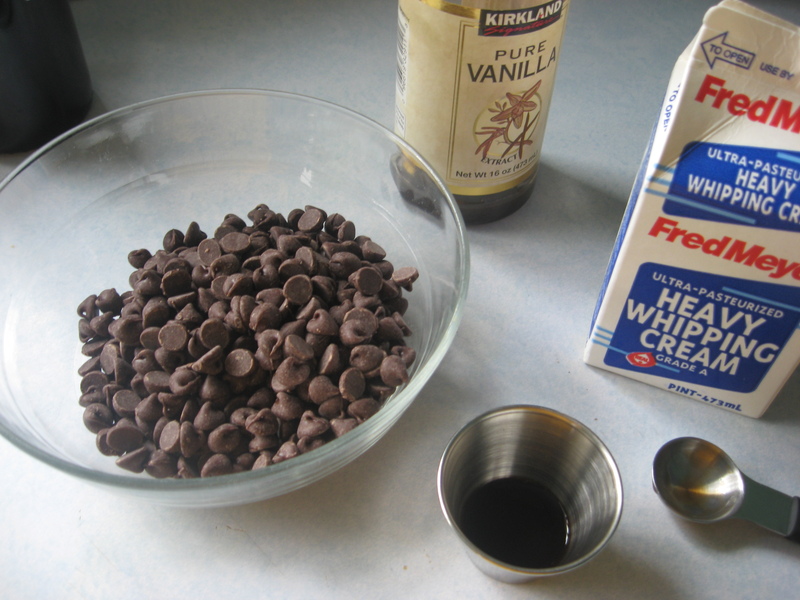 Pour remaining cream into a mixing bowl and mix on med-high (I put the wire whip attachment on my stand mixer and set the speed to 6.) until it’s starting to thicken up and you can see trails from the mixer in the cream. You do _not_ want the cream to form peaks at this point. 4. 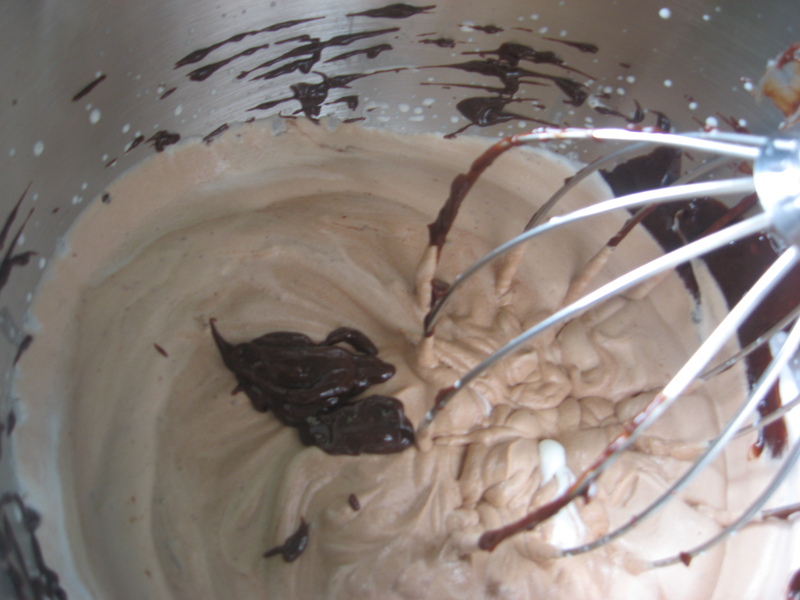 Turn the mixer to low and gradually add the room temp chocolate mixture. You can either drizzle it in while it’s mixing or add it in a few batches. Once this is mixed in, you’re done! 1. Combine sugar and cocoa in mixing bowl. 2. Add cream and vanilla. 3. Whisk together briefly to start it and then mix on medium speed for about 3 minutes, until stiff. Let me know if you have any questions and enjoy your mousse! 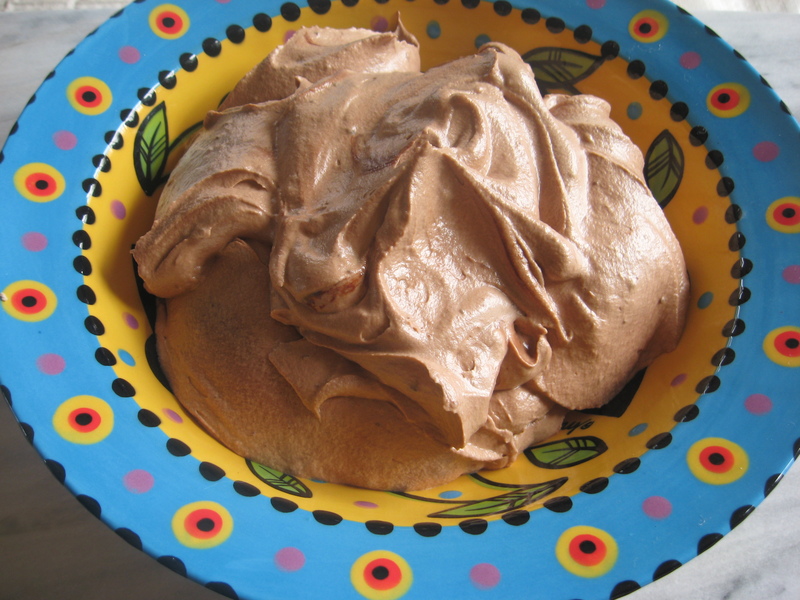 Here’s another no-bake recipe; sorry, but life is just not always what we expect, no? I’ll get back to baking soon, but right now I’m at a time where I need less time/fuss recipes. 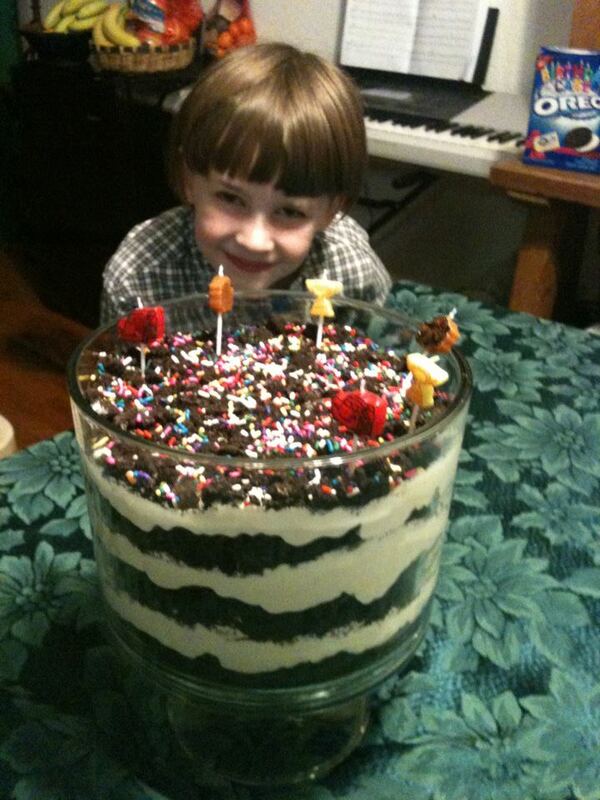 So my youngest munchkin turned 6! I can’t believe it; my boys are just growing way too fast. Being super strapped for time, I suggested this for his dessert and he loved it. I adapted it from a recipe that was given to me twenty years ago (gulp :)). It’s wonderfully creamy with a hit of chocolate and is pretty fast to put together (I think I took 30 minutes start to finish.). All you need are Oreo cookies, vanilla pudding mix, milk, butter, cream cheese, and confectioner’s sugar. I use lactose-free, fat-free milk ’cause that’s what I drink. I also use Neufchatel cream cheese, which is lower in fat yet still really good, but everything else is the non-low versions. Feel free to lighten up this recipe as you so desire with low sugar/fat or sugar free / fat free products. 1. Put pudding mix in a large bowl. Mix in milk and set aside for a few minutes to firm up some. 2. Cream together butter and cream cheese in a large mixing bowl. Use medium to medium-high speed and the flat beater if using a stand mixer. 3. Sift the confectioner’s sugar if lumpy and add to the butter/cream cheese mixture. Mix well. 4. Stir in prepared pudding and cool whip. 5. Place Oreo cookies about a dozen at a time in a ziploc bag and smash with a rolling pin or the back of a small, sturdy frying pan. An 8″ cast iron skillet makes quick work of this :)) Once turned to crumbs, place in a medium bowl and set aside. Don’t worry if they’re a bit lumpy. Continue until all cookies are crushed. 6. 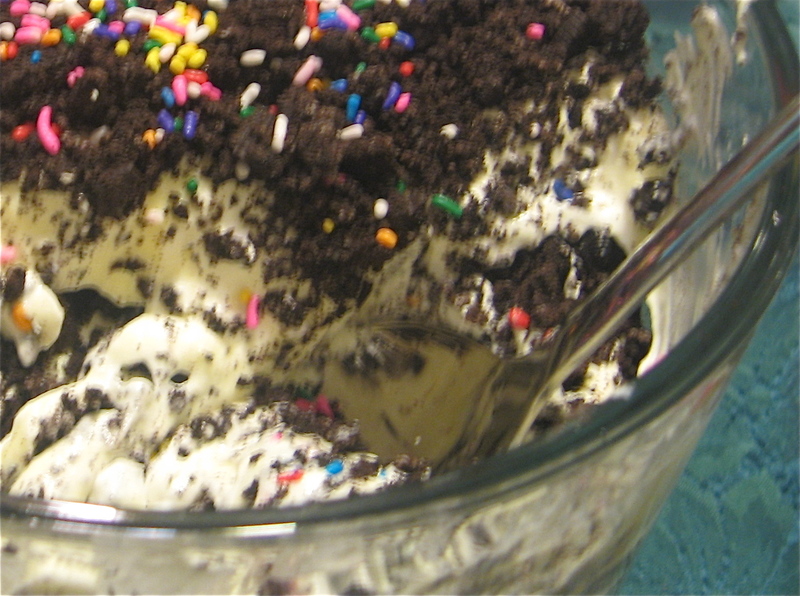 Layer the cookies and cream mixtures in a trifle dish, clean flower pot, clean dump truck (serve with a shovel :)), or other deep dish, starting and ending with the dirt. 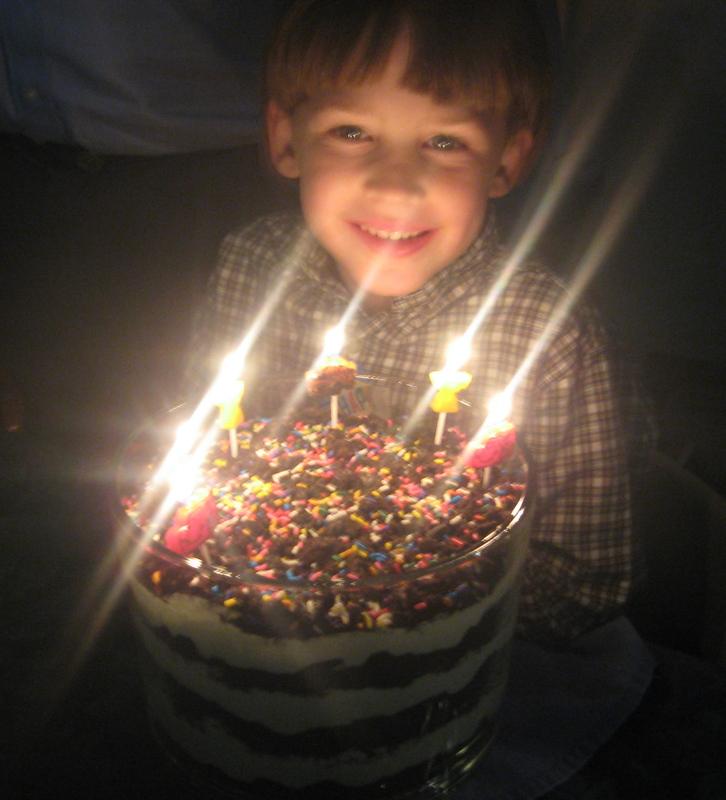 Sprinkle dirt layers with colorful sprinkles if so desired; I don’t, but it would be very colorful and kids would love it :)). If you have any leftover cream mixture, it freezes well so you can save it. 7. I sprinkled the top with candy sprinkles, but you can add gummy worms or wrap the bottom of a plant in plastic wrap and stick it down in there to make it look like a potted plant.